A replay game from Philippe Riviere. This game (version 4) used to be available from Downey Games (not free), but has been updated and version 5 is a free download (scroll down for the link). Philippe Riviere is also the updater of another replay game, Mike Clifford's "The Tour" (not to be confused with Luke Morris' "Tour"). 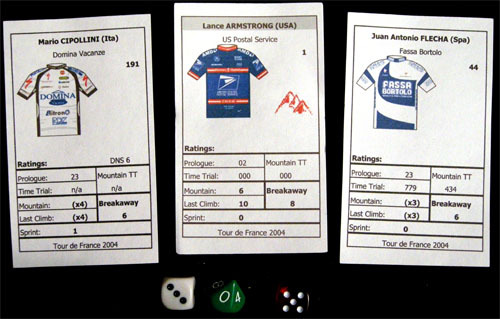 The new version of the game includes the riders of the 1991 and 2010 editions of the Tour. The rules have not changed that much from version 4, but now they are friendlier, and they offer many optional rules following feedback players of the previous versions. Update: Stats for the 2013 Dauphiné and the 2014 Tour de france can be downloaded from sportsreplays.net. 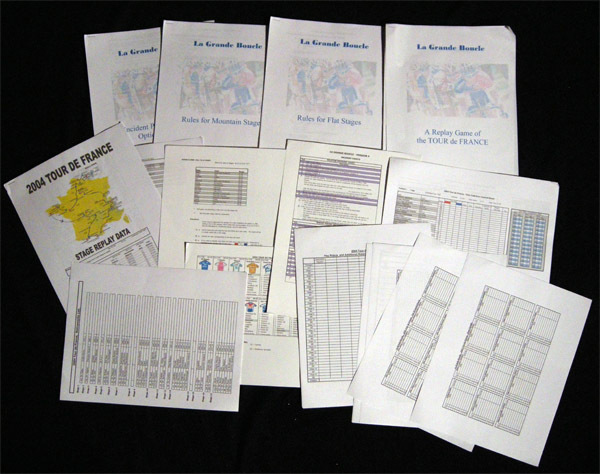 According to Philippe Riviere himself: "With the 2010 edition, you can if you wish replay the Intermediate Sprints and the Minor Climbs of 3rd and 4th Categories. You can also, if you wish, introduce Crosswind rules on certain stages and give the stage a whole new dynamic when the wind blows. You can also run Stage 3 between Wanze and Arenberg like a mini Paris - Roubaix and experience the devastating effect of cobbles sections on the peloton, or you can just run a less involved replay and still have interesting stages. With the aim of saving time on replays, by avoiding looking for riders cards amongst the 198 available, Specialist (Climbers, Sprinters and Time Trial experts) have duplicate cards within a specific set. Here too, this is an option for those who wish to use it." It is not a secret that I am not particularly fond of replay games, but this one is worth trying. There are some interesting ideas in it. The fact is that this is n ot the usual "highlight based" replay game, but a game meant to be played over several sessions, which covers the action on the full length of each stage. After all, I am asking for games with virtual teams (see New Directions In Cycling Board Games, ... ok wait until the text is finished). And what is a replay game but a game in which all teams are virtual?